It's a plug in unit that sits on a shelf inside the electrical consumer unit, so yes, disconnect the mains, undo the 2 screwsholding the lid on the consumer unit. Unplug the old charger, plug the new one in, put the cover back on, reconnect mains. 15 minutes all done. Wrong as that may be, 2m is a lot further apart than the 2ft shown in the OPs picture. Replacing the damaged hitch is an easy fix, I've replaced one myself in the past and it only takes around half an hour. I would have thought a dealer would do it much quicker. I agree it is up to the dealer to sort it rather than yourself. I imagine that, if there is a problem with the waste pipe they should be able to sort that pretty quickly, but, as has already been pointed out, is there water in the traps to the shower and washbasin to stop stale drainage smells seeping through? As a tourer, it is designed to be regularly moved which normally disperses any stagnant water in the pipes. 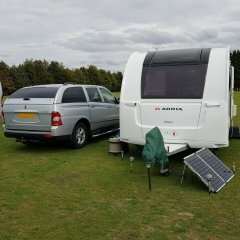 The self levelling issue and the peeling wallboard will, most likely, require it to be returned to the dealer for attention which is, unfortunately, quite normal for a touring caravan, as, indeed, It would be for a car with faults. Some of these issues will be down to paranoia on Apple's part. There was an issue a few years ago where it was possible to access the files etc. on a PC because the phone was seeing it as a charger rather than a computer. Apple then updated the software on the affected models so this connection can't be made. This has had the effect of some non-Apple chargers not being supported by iPhones. No, most, if not all, have the batteries. Certainly my current C402 model, and the C250 model fitted to my last caravan have them. A minor comment on the toilet full warning light not working. Just wanted to make sure that you realise it is powered by 2 AA batteries tucked away in the cassette compartment, rather than the caravans electrical supply, they should be able to be seen if you look up after the cassette is removed. Have you replaced these batteries, if not, that is likely your problem. Again, difficult to tell, especially from the pixel ridden video. I would also suggest reversing it in using the mover. When you say 6cm, have you added in the side marker lights, they are likely to reduce it to around 4cm each side if not. You would need to keep adjusting the jockey wheel to make it reasonably parallel to the ground to avoid grounding when you go from the level to the slope, however with a bit of trial and error you may find a suitable compromise position that works for the whole manoeuvre. The motor mover should hold it until you chock the wheels, but you shouldn't leave it engaged because it will distort the tyres, and you shouldn't leave the handbrake on when storing it for any prolonged time as it likely it will seize on. Good chocks are pretty essential, you can get levelling blocks that include a chock that might work slightly better, but, as already suggested, if you could fix come sort of chocks or blocks in position, given the slope, that would give extra piece of mind. As already posted, fuses and circuit breakers do not trip very quickly in the event of a small overcurrent. It could be many minutes, or even hours before they trip, and the site bollard may trip first. There is an adjustable device known as a current sensing relay that would do what you require, but it requires a competent person with enough electrical technical knowledge to properly install it. 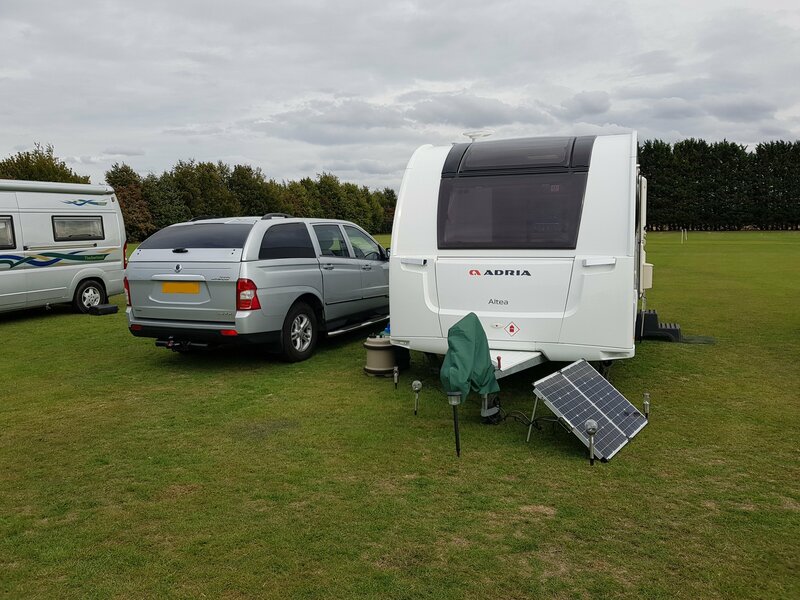 A fully charged caravan battery will easily last a weekend, even a bank holiday, with a sensible attitude to power consumption. For example, don't put the tv on in the background, only put it on when you want to watch something, don't switch on all the lights at once, just use the ones in the area you're actually using, don't leave the awning/outside light on. You just need to use common sense. I hardly ever use sites with hook ups, my only time would be for a couple of weeks holiday, the rest of my time is off grid at rallies, I've managed 5 nights use between Christmas and New year without a problem on a single battery, and that's with the dark evenings. That said, I invested in a Solar panel in the middle of last year, I'm still trying to get used to be able to put more lights on and stick the tv on without worrying about the battery. I've had over 40 years of being without a panel and hardly any hookups. But, how often does house wiring, pipework and flues get subjected to the type of vibration encountered when towing down bumpy, windy roads? You are supposed to get your home gas and electrical installations inspected and tested at regular intervals, but I accept very few people do (I'm an electrician myself, and can't remember the time I tested my own installation, but , there you go). The difference is, the house installation, although used much more, is not subject to the same mechanical stresses as that in the caravan. There is (or should be) an 80A or similar fuse between the battery and the motor mover isolator switch. I would start by making sure that it is good. Even a basic Free-to-Air satellite receiver, such as Aldi sell, although not compatible with the Freesat 7 day tv guide, will show now and next programme information for each channel, which, I find, is usually enough in the caravan. I keep an old school steering lock in the boot for travelling alone. I just wedge it against the drivers seat and extend it til the brake pedal goes down. When I've finished I just unlock it, retract it and stick it back in the boot.